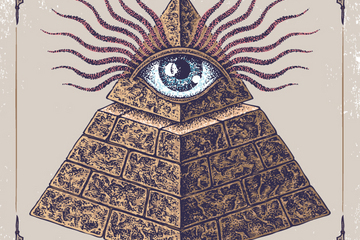 An all-seeing eye atop a pyramid is supposedly a symbol for the secret society known as the Illuminati. The Illuminati was an 18th-century secret society made up of numerous influential intellectuals and freethinkers of the time. The organization, which is also known as the Bavarian Illuminati, opposed the Roman Catholic Church’s control over philosophy and science; promoted the education of women and their treatment as equals; sought to “enlighten” people’s minds and free them from superstitions and prejudices; and tried to reduce the oppression of the state. The Illuminati was the brainchild of Adam Weishaupt, who was the chair of canon law and later the dean of the faculty of law at the University of Ingolstadt in Bavaria (a state in southeast Germany) in the early 1770s, according to “New England and the Bavarian Illuminati” (Columbia University Press, 1918), a nonfiction book about the secret society. Weishaupt was vocally critical of the “intolerance and bigotry” of the church, which, at the time, held strong influence over the University of Ingolstadt, as well the politics and government of Bavaria. His criticisms resulted in clashes with the Jesuits, leading Weishaupt to conclude that a secret organization of liberal-minded individuals was necessary to outwit the “enemies of reason.” He initially sought to join one of the Freemason lodges, but lacked the funds to do so and felt the order was too well-known to the general public. So, on May 1, 1776, Weishaupt formed the Order of the Illuminati with four other members. The Illumanti grew quickly, gaining some 2,000 members from countries throughout Europe, including France, Poland, Hungary and Italy. This rapid expansion was largely due to the prominent German diplomat Baron Adolf Franz Friederich Knigge, who restructured the order in 1780 and helped spread Illuminism by recruiting from Freemason lodges. The growth of the now not-so-secret order ultimately contributed to its downfall. In June 1784, Bavarian ruler Carl Theodore banned all secret societies; in March 1785, he designated the Illuminati as one of the branches of Freemasonry, a known illegal organization. The government began rooting out members of the Illuminati, causing Weishaupt to flee Bavaria and maintain written correspondence with leaders of the order, called Areopagites. In October 1786, officials searched the home of a prominent Areopagite and seized books, papers and more than 200 letters between Weishaupt and Illuminati leaders that detailed the most intimate affairs of the order. The government quickly published the documents, which held the names of a number of Illuminati members. In August 1787, Duke Karl Theodore Dalberg of Bavaria landed a final blow to the Illuminati when he issued harsher punishments — including the death penalty — for anyone found to be part of the organization. A handful of later organizations claimed to be descended from the original Illuminati, and some authors have asserted that the Illuminati survive today, but these claims are largely unfounded. Follow Joseph Castro on Twitter. Follow us @livescience, Facebook Google+.